Residential - Service will run one day behind throughout the holiday week, beginning with services scheduled for the holiday. Republic Services (RS) will resume yard waste pickup service on Wednesday March 6, 2019 and continue the service through December 24, 2019. Collection is limited to 10- biodegradable paper bags, plastic bags, averaged sized containers, or bundles (or a combination thereof) per pick-up day. Brush and limbs must be less than 6 inches in diameter, cut into 4-foot lengths or less, bundled with rope or twine and cannot exceed 50 pounds. Yard waste or bundles that do not meet these set-out requirements will not be collected. More than 10- bags and/or bundles of tied yard waste may be scheduled for a special pick-up at an additional charge. Republic Services does not collect dirt, bags of mulch, sod, rocks, open containers with poison ivy/oak/sumac, or uncontained brush with thorns. If you have been hanging on to your Christmas Tree in the hopes of keeping it out of the regular solid waste stream, now is the time to unload it. To be assured of pickup, the tree should be cut into 4-foot lengths (as is the rule for "yard waste"), however some RS customer service representatives have stated that RS will accept Christmas Trees up to eight feet in height. For sure the tree must be devoid of all lights, ornaments, and tinsel. March 4, 2019, 7 p.m.
6.1. Discussion of WCA procedures and methodology for managing cluster improvements. 6.2. Discussion of WCA public-private boundary survey. Someone has installed a real estate sign in the common area next to the Waterview Cluster entrance off of North Shore Drive. "Heavy duty" real estate signs must be installed on the for-sale private property, not the cluster common area. 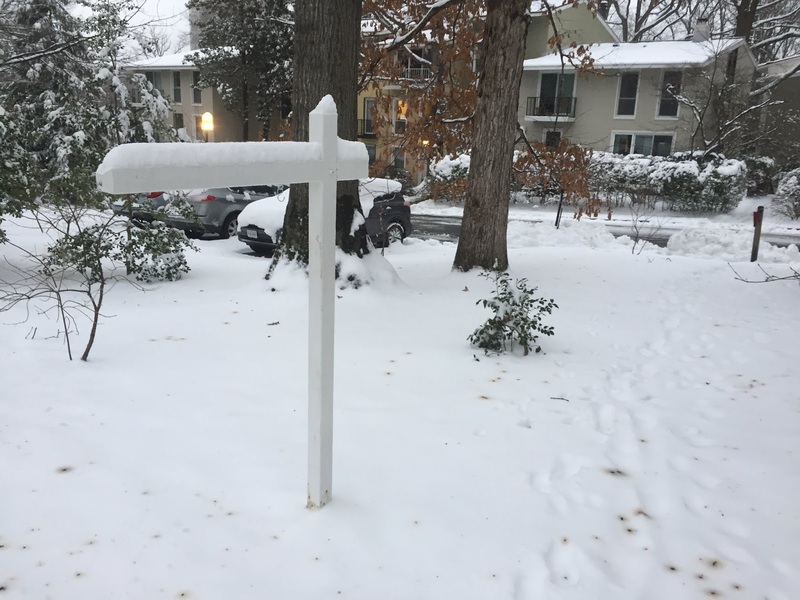 This sign post must be removed at once. A brand new shiny light fixture was installed this afternoon. Hats off to the Reston Association Central Services crew that got it restored quickly while keeping me informed throughout the entire process. The wounded light fixture was disconnected and removed by Reston Association on Tuesday. A new pole and base will be fabricated and RA hopes to have the replacement installed next week. An adjacent light fixture was seen to have significant deterioration at the base. It, too, will be replaced during the next maintenance cycle. A pathway light fixture in front of 11406 Orchard Lane keeled over on Sunday February 17, 2019. The incident was reported to Reston Association (the owner of that fixture) the same day and we were told that a maintenance would address it on Tuesday, February 19, 2019. Surface traffic-circle parking spaces (5 spaces) located the far end of 2-level carport at top of stair, should be vacated as a precaution. Currently scheduled for Thursday, February 21 and Friday February 22, but a winter storm may require new schedule! Republic Services will collect Christmas Trees on Wednesdays from December 26, 2018 through February 27, 2019 January 31, 2019. Republic Services bulk pickup service, including Christmas Tree pickup, has been in disarray due to the weather conditions and, apparently, organizational chaos. A special order was placed today, Thursday February 7, 2019, to collect Christmas Trees from both sides of Waterview Cluster on Monday February 11, 2019. Please remove all lights, ornaments, tinsel, etc. Trees over six feet tall must be cut in half.